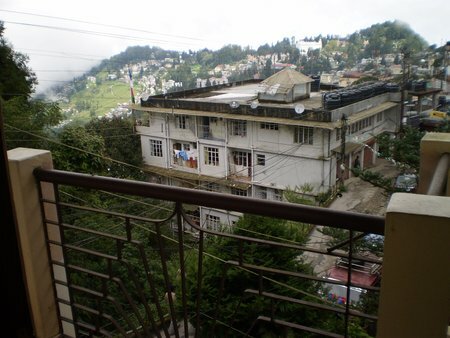 If you are craving for great views of the Eastern Himalayan Mountain range, the snow peaks including that of Kanchenjunga, the wonderful landscape of Darjeeling town on the hill slope, comfortable stay and all that from a budget hotel, Broadway Annex can be a nice choice. Sounds too good to be true? There is a catch here I must admit. Nothing comes easy in life and the same principle applies here as well. While you do get all the Pro's I mentioned above, the cons is the fairly long strenuous uphill walk to reach up to the hotel. I know that whether a walk is long and tiring depends on the person concerned. If you ask Amit, the owner of the hotel, he'll say it's about 5 minutes walk from the main Broadway Hotel which is located far below and centrally near the Clock Tower. This one is an annex to that main hotel. Well I agree, he being a local can walk it in 5 minutes from there. I walked it in 10 minutes. For a city walker not used to regular long walks or hill walks, it can easily take 15 minutes or even longer if you take few breaks in between. The Cooch Behar Road leading to Hotel Broadway Annex located at Zakir Hussain Road is really steep. I won't recommend this walk for elders. One can also approach the hotel from Chowrasta Mall. That too will take about 15 minutes but the slope is relatively gentle in that route. The reception or the lobby is at a higher level. So from the ground floor entrance, you will need to climb a few stairs to reach the reception. I was greeted by Dipak Rai, an attendant as I walked in and soon Amit Khatri, the owner too joined us. Amit is a nice pleasing personality. We have been knowing each other for a while. He is also the owner of the main Broadway Hotel. Broadway Annex is an old building called Surya Bhawan built in the early 1960s. The hotel has been recently renovated. It has 14 well appointed rooms. The dining room and the kitchen is located on the same floor where the reception is. They prepare Indian, South Indian and Chinese dishes. On request, you will also get Bengali dishes including rice and fish curry. Out of 14 rooms, there are four rooms that are wood finished. Room no. 202 is special with excellent views and seems to be in great demand. Some of the rooms have their own private balconies. On the second floor there are eight standard rooms. 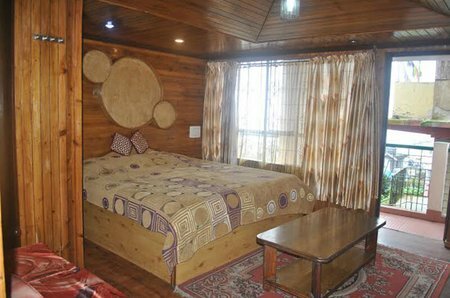 While most of the standard rooms do not have private balconies, they do have access to a common balcony or a viewing gallery from where one gets excellent view of Darjeeling landscape and the snow peaks. There are also few back rooms which have no views, but are still quite spacious. Amit, the owner and his family live on the top floor of the building. He once invited me to his house for breakfast. 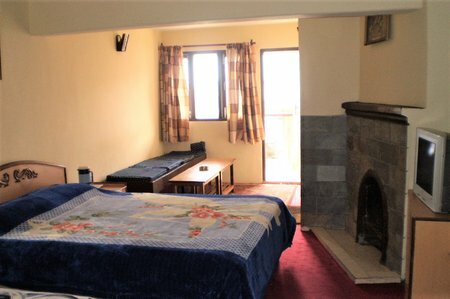 The large living room with surrounding open balcony offers a superb view of Darjeeling town and the mountain range. Well, one advantage of staying in this hotel is that you get direct attention of the owner all the time. 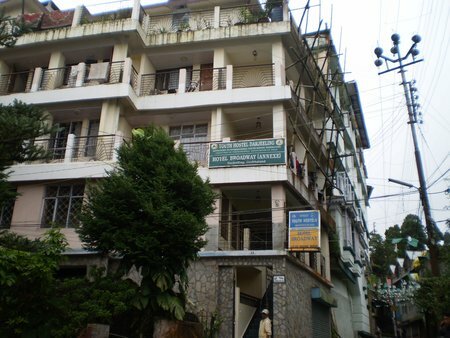 Hotel Broadway Annex in located on Zakir Hussain Road. You can approach it either from Gandhi road via Cooch Behar Road, or from the Chowrasta Mall. In the first route the gradient of the road is quite steep, while from the mall the slope is gentle. In either case it takes about 15 minutes to reach the hotel by walk. Amit mentioned and I agree that if you are staying for several nights, over time you will get used to this walk. Taxis can come up to the hotel though. There are no great shops or marketing areas close to the hotel. However as you walk down and take the first bend, on your right will be Petrichor, a great Cafe and Art Studio (X closed down). Further down on the left you will find couple of other small cafes like Mistyck Mountain, Himalaya Dreams etc. The latter also offers treks, tours, eco tourism etc. Close by is Catherine Villa the residence of Dy. Inspector General of Police, a nice beautiful bungalow. Dear Raj, The informations about each and everything related to Darjeeling that has been put up by you has helped us a lot planning an upcoming wonderful trip in the month of May. For the stay scheduled in May, 2015 I have booked Hotel Broadway (annexe) through Youth hostel association of India. I am going with my parents and has booked a four bedded room. I need to know how is the hotel and is there any water problem there. And how much this hotel is far from the Mall. As a budget accommodation, it's a nice hotel with decent amenities and nice views. But it's a bit far from the Mall (town center) and uphill walk. While coming down all the way along Zakir Hussain Road, it'll take about 25-30 minutes to reach the Mall. However you can take a short cut through Coochbihar Road and then take Nahru road for the Mall (about 12-15 minutes, but steep gradient on Coochbihar road).